I had to find and fix some leaks this week – in my yard. See, my underground storm sewer pipe, that carries my basement sump pump discharge and my house’s gutter drains to the street, was leaking. The evidence was clear…swampy puddles were developing in my neighbor’s yard. The location was clear…several patches of grass in MY yard were WAY more green and vibrant than the rest. That’s about 8ft worth of root growth that was clogging my drain pipe, and causing leaks upstream. My maple tree is not shown in the picture because my maple tree is a real jerk. I tell you all this, dear reader, so you know that I. Don’t. Like. Leaks…whether they be in my storm sewer pipe or in your compressed air system…which brings me to the (real) subject of my blog today. Unlike the visual indications of my yard leak, compressed air system leaks don’t really draw much attention to themselves. Unless they grow quite large, they’re typically invisible and very quiet…much too quiet to be heard in a typical industrial environment, anyway. Good news is, they’re not all that hard to find. One way is to use a soap-and-water solution. You just need a spray bottle, some dish soap, and water. Spray it on the piping joints, and all but the smallest, most minute, of leaks will create soap bubbles…instant indication of air leakage. This method is inexpensive and simple, but it does tend to leave little puddles all over. Plus, if your header runs along the ceiling, you’re going to have to get up there to do it. And unless you can easily maneuver all the way around the pipe, you can miss a leak on the other side of the joint. If you have a small and relatively simple compressed air system, and all your piping is accessible though, this method is tried and true. 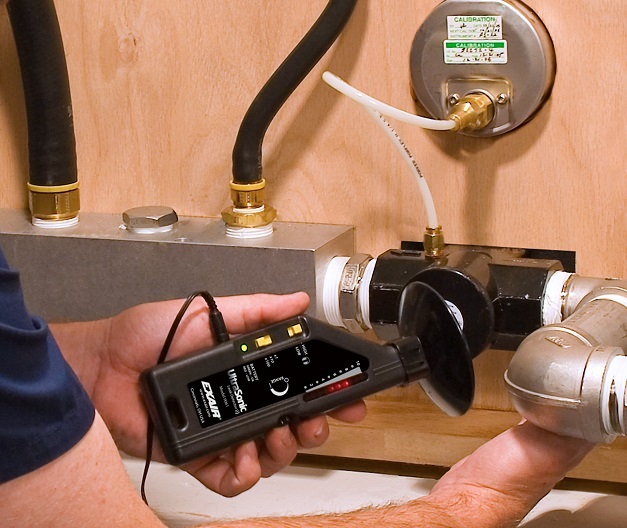 EXAIR Model 9061 Ultrasonic Leak Detector discovers and pinpoints leaks, quickly and easily. Find leaks and fix them. This is Step #2 of our Six Steps To Optimizing Your Compressed Air System. If you’d like to find out more, give me a call. How do I make our compressed air system efficient? This is a critical question which plagues facilities maintenance, engineering, and operational personnel. There are concerns over what is most important, how to approach efficiency implementation, and available products/services to assist in implementation. 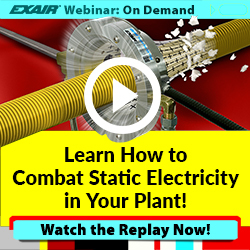 In order to address these concerns (and others), we must first look at what a compressed air system is designed to do and the common disruptions which lead to inefficiency. The primary object of a compressed air system is to transport the compressed air from its point of production (the compressors) to its point of use (applications) in sufficient quantity and quality, and at adequate pressure for proper operation of air-driven devices. In order for a compressed air system to do so, the compressed air must be able to reach its intended destination in proper volume and pressure. And, in order to do this, pressure drops due to improper plumbing must be eliminated, and compressed air leakage must be eliminated/kept to a minimum. But, before these can be properly addressed, we must create a pressure profile to determine baseline operating pressures and system needs. After developing a pressure profile and creating a target system operating pressure, we can move on to the items mentioned above – plumbing and leaks. The transportation of the compressed air happens primarily via piping, fittings, valves, and hoses – each of which must be properly sized for the compressed air-driven device at the point of use. If the compressed air piping/plumbing is undersized, increased system (main line) pressures will be needed, which in-turn create an unnecessary increase in energy costs. In addition to the increased energy costs mentioned above, operating the system at a higher pressure will cause all end use devices to consume more air and leakage rates to increase. This increase is referred to as artificial demand, and can consume as much as 30% of the compressed air in an inefficient compressed air system. But, artificial demand isn’t limited to increased consumption due to higher system pressures. Leaks in the compressed air system place a tremendous strain on maintaining proper pressures and end-use performance. The more leaks in the system, the higher the main line pressure must be to provide proper pressure and flow to end use devices. So, if we can reduce leakage in the system, we can reduce the overall system pressure, significantly reducing energy cost. 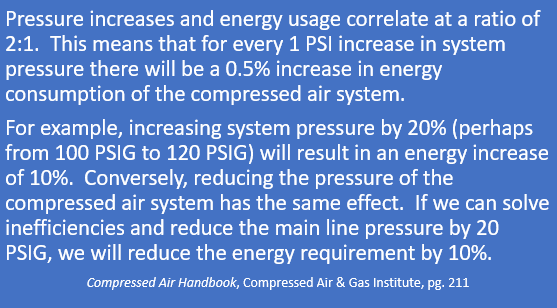 Understanding the impact of an efficient compressed air system is only half of the equation. The other half comes down to implementation of the solutions mentioned above. In order to maintain the desired system pressure we must have proper plumbing in place, reduce leaks, and perhaps most importantly, take advantage of engineered solutions for point-of-use compressed air demand. Once proper plumbing is confirmed and no artificial demands are occurring due to elevated system pressures, leaks in the system should be addressed. Compressed air leaks are common at connection points and can be found using an ultrasonic noise sensing device such as our Ultrasonic Leak Detector (ULD). The ULD will reduce the ultrasonic sound to an audible level, allowing you to tag leaks and repair them. We have a video showing the function and use of the ULD here, and an excellent writeup about the financial impact of finding and fixing leaks here. 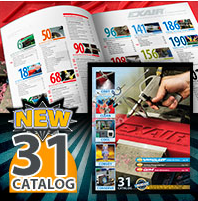 The EXAIR catalog – full of engineered solutions for point-of-use compressed air products. With proper plumbing in place and leaks fixed, we can now turn our attention to the biggest use of compressed air within the system – the intended point of use. This is the end point in the compressed air system where the air is designed to be used. 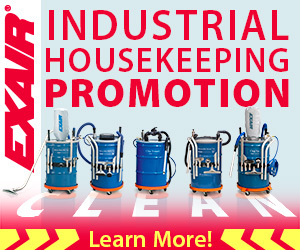 This can be for blow off purposes, cleaning, conveying, cooling, or even static elimination. These points of use are what we at EXAIR have spent the last 34 years engineering and perfecting. We’ve developed designs which maximize the use of compressed air, reduce consumption to absolute minimums, and add safety for effected personnel. All of our products meet OSHA dead end pressure requirements and are manufactured to RoHS, CE, UL, and REACH compliance. If you’re interested in maximizing the efficiency of your compressed air system, contact one of our Application Engineers. We’ll help walk you through the pressure profile, leak detection, and point-of-use engineered solutions.